Available in 500g, 1kg, 2kg, 4kg, 9.1kg and 10.5kg bags. 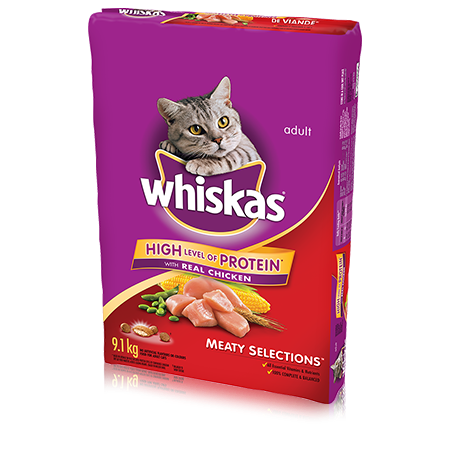 WHISKAS ® MEATY SELECTIONS ® with Chicken 9,1kg is rated 4.3 out of 5 by 89. Rated 2 out of 5 by Jason from Not Liking the new Mix have been buying Whiskas Meaty selections for..... as long as I can remember. My cats love it. Until recently. Scratch that, they still love it with the exception of a new addition to the mix in the bag. I have photos but do not see a place to post them here. My issue is that it seems like 30% of the bag is filled with this new Kibble that was not there before. I should tell you my cats are outdoor cats and eat crane flies and June bugs, but will not touch this new addition to your product. I don't know what flavour it is but I'm guessing it's worse then June Bug. Or maybe Broccoli. Anyway I had to throw out almost half a dish full of food every time I fed them because they would leave it in the dish. I will go to a different forum and post pics. Thank You for your time. Feel free to contact me if you have any follow up questions. Rated 5 out of 5 by Mae6 from Picky cats love All of my six cats adore this food, one if them always used to get sick until this product came out. That being said it has become increasingly difficult to find at stores near us. Our local Walmart stopped carrying it. Please make this great food more available and in bigger bags. My cats are 5 big boys and one tiny old girl! Also have 3 chihuahuas. Rated 3 out of 5 by CORINASMB_346707177 from My 3 cats did eventually eat it, they just like to take their time deciding if a new food is worthy of them eating it. I always leave 2 types of dry in their bowls and they did eat it after checking it out after a few days. It seemed to agree with all 3 and would buy it again. Te word finicky was created for my 3 cats so hard to say would a normal cat would do immediately after seeing a bowlful of new food in front of them. My cats are older, so oral care is important in their everyday diet and well being. Rated 3 out of 5 by KELLYSBC_346726474 from I tried Whiskas Dry Oral Care cat food and I found that the size and shape of the bits were of a good size. Unfortunately my cat did not like the taste nor did the other 2 cats that live in the suite above me. Once I added a different flavour of Whiskas to the mix they were eating it not problem. Not sure if it's the size or the flavor that they didn't like. 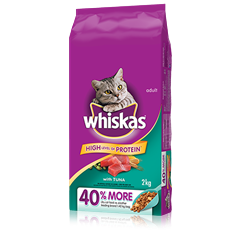 Rated 5 out of 5 by PENELOPENQC_3391358204 from My cat does not like all foods but he definitely liked the Whiskas Dry Meaty Selections very much. He ate every single morsel, and licked the bowl each meal. I like the fact that it has such a high level of protein, as my cat is diabetic so it is good for him to eat a lot of protein. I will definitely continue to buy Whiskas for my boy, Jack. Rated 5 out of 5 by SHERYLMON_346697840 from I noticed my cat's breathe didn't smell as bad. Mya enjoyed the food since she actually ate it right away. Unlike other times when I've switched her food... She would smell it, walk away, and look at me like, why did you buy that, it's gross. I will definitely buy this again. Thank you for letting me try before I buy! Rated 5 out of 5 by LEAHSON_346700729 from I loved everything about the product my cats seemed to as well. My only issue was trying to find the size bag that the coupon was for, I could only find the smaller sized bag. Finally after checking grocery stores, Walmart Petsmart.. I found it at Canadian Tire. Thanks for the sample, will be buying again. WHISKAS® MEATY SELECTIONS® with Chicken is formulated to meet the nutritional levels established by the AAFCO Cat Food Nutrient Profiles for adult maintenance.